Whether you’re buying a new home or remodeling your current home, one thing is clear – people today are downsizing. One compromise is often the size of the kitchen, but while kitchens may be getting smaller with some smart design ideas and storage options from Merillat® cabinetry, homeowners won’t have to compromise on function. Think Vertically: While the square footage may be lacking, opportunity for storage often lies in the ceiling height. A tall pantry or utility cabinet allows the homeowner to store many different items in one central location and at different levels, making some things more accessible or inaccessible for children. Pull-out trays, like the ones offered in Merillat cabinetry, can make awkward items easy to reach. In addition, flanking the refrigerator with two pantries can add storage in a convenient location. Also, stacking cabinets to the ceiling creates space for storing seasonal items and other large pieces not used as frequently. Merillat Classic® Portrait door style in cherry with paprika finish. A tall pantry allows for storage of many different items in one central location and at different levels. Plus, stacking cabinets to the ceiling and above the refrigerator adds the perfect storage place for seasonal or less used items. Be Open Minded: Glass doors or floating shelves can make a cramped room feel more open and airy. Furthermore, this storage option can make items more accessible or can allow the homeowner to get creative by displaying dishware or collectables that reflect their personal style. Hide It Away: Avoid clutter by limiting the number of kitchen items sitting out. 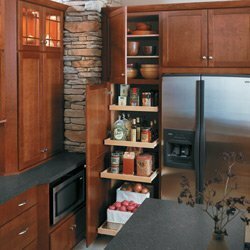 Merillat cabinetry offers a number of storage solutions that meet this need. For example, your knife set can be easily stored in a cutting board kit from Merillat cabinetry; the cutting board and knife storage are built into the drawer saving counter space. Another option is a pull-out wastebasket. This saves floor space and the two-bin design keeps trash and recyclables separated and out of sight. Lighten Up: Sticking to cohesive natural hues and lighter colors gives the room balance and allows the eye to move across the space easily, creating the illusion of more space. From fresh and clean painted white cabinets to the soft look of natural maple wood, the style of the cabinet should be kept simple. Slab front doors or Shaker style often work best in small spaces. In addition, hardware should be used minimally.